Scholastic recently released the results from a comprehensive survey of attitudes towards reading held by children and their parents. The report provides a snapshot of how much Americans read and how important the respondents felt reading to be. 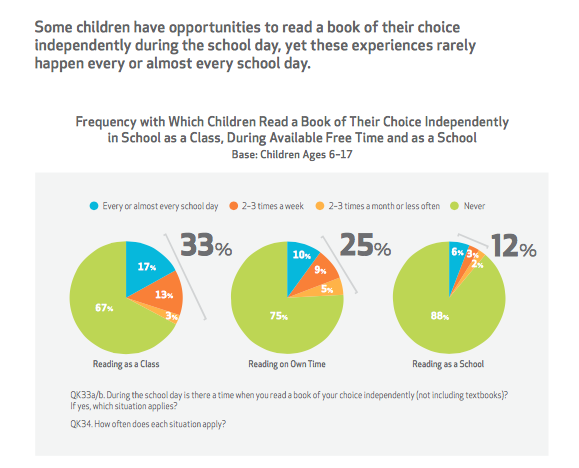 Over 2500 parents and children were surveyed and asked a variety of questions about their frequency of reading and why they were doing it. The report is chock full of information and is worthy of every teacher’s review (especially English teachers). The full report can be accessed here. I can summarize the report with two words: choice and frequency. Provide access to books by building robust classroom and school libraries. Invite choice by working with students (mostly younger) using the “Yours, Mine and Ours” strategy. Build time to read and share during the school day and at home. Guide students as they read by conferencing often, checking for understanding, and tracking progress. Personally, I’ve seen the power a robust classroom library can have on students. A few years ago, my former co-teacher Sarah began bringing her books into our classroom and started stacking them everywhere. I mean everywhere. She stacked them on desks and in corners. They were literally all over the place. She’s the only person I know who would bring an empty suitcase to the annual NCTE convention just to fill it with books for her students. So, over time our classroom became a giant repository of books. The crazy thing is, kids started taking the books home. They grabbed the John Greens, the Harry Potters, and the Twilight and Divergent series. And then the students started talking about the books they were reading. It became contagious. They read during breaks and when they walked down the halls. I started reading their books so I could stay in the conversation. An Abundance of Katherines? Yup, I read that. Looking for Alaska? Yup, read that too. I’m a big John Green fan now. 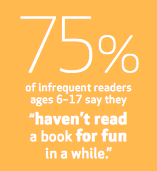 By surrounding kids (and adults) with high-interest texts we can encourage them to read. I’ve seen it work. Building small libraries. Classroom libraries can be powerful. However, I also want to build small “mini libraries” throughout a school wherever there is an open corner or unused space in a hallway. An armchair or two and a small bookcase packed with young adult literature can help encourage students to just grab a book and read. Student and parent reading assignments. When I taught I would send students home with a newspaper and they had to choose any article they wanted to read but they had to read it with a parent/guardian and write a reflection on the process. I always loved the thought of a parent/guardian and student sitting down to read the paper together and discussing an article. In hindsight, I wish I did this more. Informal book clubs. Don’t limit these to just students. Invite teachers to join the conversations as well. Doing so will help build a culture of reading in a school. As teachers, we all know the benefits of getting kids to read. For me, it is one of the most important predictors of student success. 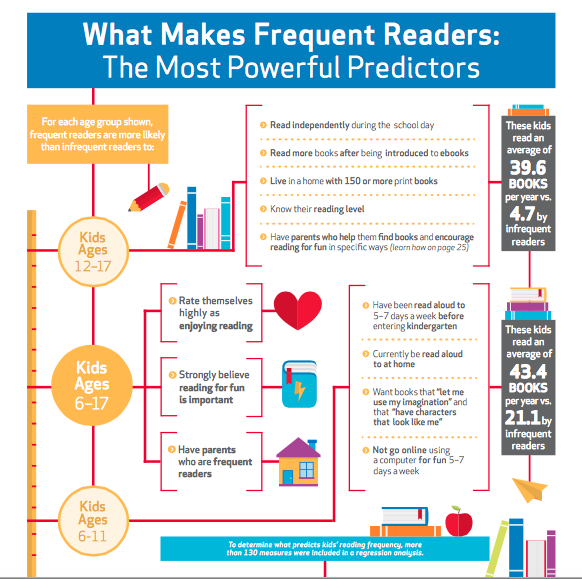 Frequent readers are oftentimes more successful students. The Scholastic report makes a case for schools to talk about how we can get students to read more. “While both children and parents agree that reading skills are the most important skills kids can have,” the report notes, “children are reading somewhat less often than they did four years ago.” In an age where there is so much competition for a student’s attention, it’s vital we encourage our students and children to read as often as possible. I’d like to see more transformational space in schools which encourage reading and discussion groups… Kind of like the ‘reading nook’ in un-used hallway space. RHS’ library is the perfect example. It’s welcoming and offers a variety of different seating options. I have a junior on his computer reading about AC Compressors for his truck and another reading about stators for his motorcycle right now. One of them just said that they feel they read more with the availability of technology, but it is more informational reading than literature. The state of reading is definitely changing and high interest text is definitely necessary.